Okamoto, E. (2015). JASAL 2014 Forum. Self-access conversations: beyond classroom borders. Studies in Self-Access Learning Journal, 6(1), 142-155. This article reports on the JASAL Forum held at the JALT Conference in Tsukuba, Ibaraki on Sunday November 23, 2014. Founded in 2005 by Lucy Cooker and Garold Murray, JASAL (the Japan Association of Self Access Learning) organizes an annual Forum devoted to self-access, language advising and learner autonomy at the national JALT conference, and members are invited to present their research and practices through presentations, posters and discussion. This year’s forum consisted of four presentations and a group discussion based on the theme of ‘Self-Access Conversations: Beyond Classroom Borders’. Presentations were made on the challenges of setting up a new self-access centre, tips for running a self-access centre smoothly, ways to attract users, and ways to evaluate self-access centres. In keeping with this year’s JALT theme ‘Conversations Across Borders’, JASAL held the annual forum to offer both members and non-members an opportunity to engage in dialog that extended beyond the borders of our own SACs and institutional contexts to share professional experiences, observations and research into current practice. 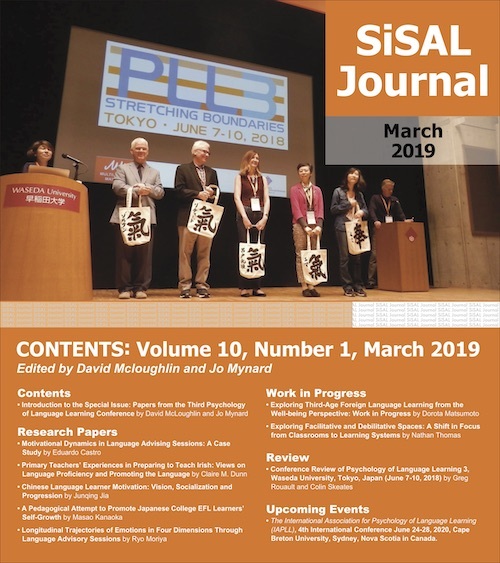 As SACs themselves offer seemingly endless opportunities to extend language learning beyond the confines of the classroom, institutions are that are realizing, or continue to realize, the value of self-access facilities are becoming more widespread in Japan. This year’s forum took the format of several short presentations and a whole-group discussion. All presenters either run or work in self-access centres as directors, teachers or learning advisors. The following sections begin with sharing and learning from the challenges of setting up a new SAC, followed by advice and tips from those experienced in the field, an initiative to start ‘movements’ and create ‘culture’ in SACs, and the importance of evaluating SACs. Both newcomers to self-access, Greg Rohe and Vick Ssali of Aichi Gakuin University’s Global English/Global Studies Department started the forum off with a discussion of some of the issues they encountered when establishing the Aichi Gakuin (AGU) English Lounge last year. Determining what kind of center was needed, what kind of space would be appropriate to maintain, obtaining and managing funding, and staffing were discussed in detail in their presentation, as well as their plans going forward. According to Gardner and Miller (1999), becoming well-informed about a number of issues is necessary before planning a SAC – such as reading the literature, having discussions on planning and set-up, determining which sort of system to adopt, and visiting as many SACs as possible (among others). After it was decided that the AGU English Lounge was to become an institutional entity, one of the first issues Rohe and Ssali had to contend with was finding an appropriate physical space with the size, accessibility and visibility they had in mind. Limited to non-classroom spaces, they were faced with choices that had limited or indirect foot traffic, which defeated the purpose of visibility (a key variable for them in attracting students to the new center). Another seemingly trivial, but critical factor that was discussed was defining the space by name. How learners imagine a space to be, perceive it, define it and articulate their understandings transforms a space into a place (Murray, Fujishima, & Uzuka, 2014). And, in Rohe’s estimation, can also help stakeholders develop a clear image of the space, which, in turn, helps understanding as to how the center benefits the institution at large. Also the collaborative efforts of both Japanese and foreign staff, who have significant insight into what resonates with students in both languages, had a significant role in the creation of the English Lounge’s ‘conceptual space’ – which conceived of the space as an informal, social, learner-centered one; essentially a place ‘by the students and for the students’. In accordance with that idea, student staffing was determined to be the most appropriate, and most budget-conscious option for the centre. Ssali discussed the challenges of budget constraints on staffing options, particularly when full-time staffing is not possible. This issue was resolved by employing student staff through AGU’s Learning Assistant program on a part-time basis. Ssali also touched upon the challenges of coordinating student schedules with opening times and establishing criteria for finding staff members that were able to function successfully in a strictly English-speaking environment. As it was decided that the English Lounge would function on developing learners’ speaking skills, student staff members would have to fit a certain criteria. Students would likely be learning through dialogue and interaction, supporting staff would first and foremost need to be proficient speakers, and have some knowledge and experience of studying abroad. According to Vygotsky (1978), getting explanations and support from a more knowledgeable other is a way of learning. It was also mentioned that the influence of budgetary constraints would also require that staff members be willing to approach the program with motivation and contribute creative ideas toward the promotion of the English Lounge. As a structured training program was not initially established at the time of opening, Rohe and Ssali were pleased to announce that going forward this year, a student staff training system has been put in place. Also, greater foreign faculty participation has been established (staff members are available in the centre on a featured monthly basis), and promotion and advertising efforts are also under further consideration to generate more interest in the lounge. As Gardner and Miller (1999) pointed out, one of the criteria for becoming and staying well informed in SAC management is visiting established SACs in order to gather insights into the issues and challenges encountered by others. Following a recent JASAL-organized SAC visit, both Ssali and Rohe mentioned their ongoing efforts to visit other SACs to consider new ideas, and engage in further dialog to get advice and inspiration from other institutions. As self-access is a practical field involving the management of various types of learning spaces, those working in such spaces would benefit from investigating how other centres are functioning in order to learn from their best practices and experiences (Thornton, 2014). Addressing both newcomers to self-access and seasoned veterans in the field, SALC Director Jo Mynard and Learning Advisor Satoko Watkins of Kanda University of International Studies shared a range of ideas, or practical ‘tips’ for implementation that have worked well in their context, and also some ideas that they have noticed working well elsewhere. The presenters also shared a self-evaluation tool that all participants can use and adapt in order to help them to plan the next steps in setting up, or improving any sort of self-access facility. In order to illustrate the diversity of roles for those involved in self-access, Mynard and Watkins noted that the following 20 tips could have easily been 120, in that there are as many things to do as there are ways to improve. Tips can be applied to a range of individual SAC environments and are organized in this paper according to the following corresponding areas of concern: SAC space, staffing, materials/curriculum/services, administration, and community building. The following tips are presented list-style for ease of reading and reference. Make your self-access center an inviting and comfortable space for students by filling the space with multi-purpose furnishings, and make sure there is plenty of natural light, for positive effects on mood and productivity. Use eye-catching posters and signs (designed and/or handmade) and make them highly visible to attract learners to the space. Even if you don’t have much to show off, still invite students in to have a look around and see what’s available. As many students don’t have the experience of using materials freely outside of the classroom, tours and orientations help them to know what’s available so that they can fully embrace the space and feel comfortable using it. Offer high-speed internet access to boost user/staff productivity. Full-time learning advisors are key members of SACs – but they do require sufficient budgetary resources and institutional support to operate. Advisors have a specialized supporting role outside of the classroom to help students work on their learning objectives, and as such require ample professional development opportunities and support. Situate advisors in visible areas where they can have direct contact with students, such as at a help desk, or other drop-in service areas during regular operational hours. Establish a reservation system for individual advisors (online or off). Establishing a comprehensive training system for administrative work (with at least two training workshops per year, a training manual written by senior students), plus mandatory mentoring and support from more experienced staff is essential for student staff members who work at self-access centers. Create personalized training portfolios that are transparent and accessible to student hires and administrative staff. Portfolios should contain detailed information about the training process, such as how they have been trained, by whom, when, and comments from mentors and supervisors. Materials should also cover data entry and materials processing procedures as well as equipment maintenance, and how to assist other students in the SAC. Peer mentors can offer access learning tips, emotional support, etc. Peer support, in addition to learning advising, can enhance learning opportunities and can be accessed in a variety of ways. Volunteering opportunities can be achieved within any budget, and can be an ideal way for students to become more involved in university life. Activities can be student-initiated, or staff recruited. Offer a wide range of choice of learning materials to accommodate different learning preferences, goals, and interests. Authentic and challenging materials stimulate learning, so be sure to provide them in addition to level-appropriate materials. Applies to both budgeted and non-budgeted, or low budget SACs. With a budget: Consider what the most important materials to have are; Without a budget: If receiving donated materials, establish and make known policies and guidelines for receiving appropriate and useful materials. Students should learn how to choose appropriate self-study materials on their own, but often need support in doing so. Staff recommendations situated in designated resource sections and high-visibility areas can help. Offer a series of systematic courses and modules, handouts and leaflets (including online resources) supporting self-directed learning. Promote learner autonomy through engaging learning materials. Situate and establish support services from teachers in designated spaces (conversation lounge, writing center) in close proximity for easy access. Offering designated workspaces for individuals and groups afford learners further options and flexibility. Detailed records of SAC usage can be kept in a database for at-at-glance reference to area usage and other statistics, allowing resources to be adjusted accordingly. Administrators need to continuously educate themselves and build awareness of the rules for usage of copyrighted materials (which differ for classrooms and SACs). Organized social events and activities are fun, and a great promotional tool. Social opportunities in the SAC can help learners develop a sense of ownership. Learners can also find materials and resources that are interested in through incidental learning opportunities. Assist in the organization, staffing, and operation of student-run community groups such as conversation clubs or independent study groups. Conduct student and teacher-lead workshops (paid and volunteer) that are relative to the SAC experience, featuring such topics such as knowing how to use movies for language learning, time management, study abroad, etc. Social media/networking channels can be used to engage both SAC users and staff like in publicizing of events and posting notices. Involving students in social media affords them a greater sense of ownership and participation in the SAC space, and strengthens its status as a communal entity. Director of Foreign Language Study Support Center and lecturer at Tokoha Gakuen University, Satomi Shibata has been involved with self-access centers for over a decade. In her presentation, Shibata asserts that how and why students decide to use a self-access center (SAC) depends on a number of influential factors, and questions whether or not it is possible to create an environment that will help learners choose to make the best use of SACs. Using Granovetter’s Threshold model (1978) of collective action as a springboard (defined, in short, as a situation in which in order for a movement (or action) to happen, those who decide to take action is dependent on how many other people are already acting), Shibata proposes the idea of ‘starting a SAC movement’, in which learners working toward the same purposes could support each other and foster a ‘culture’ that helps other learners recognize the value of, and make the best use of self-access learning spaces. As issues with attracting students and underuse can often plague SAC operations, Shibata believes that getting as many students to use the center as possible (particularly in a small center) is a key factor. In a small, but active SAC environment such as Shibata’s, which is run by one full-time staff member and two assistants with participating staff facilitators, budget and resources are limited, and as such, the focus of the center is mainly on developing learners’ conversation skills and offering learning advising services in English, as well as promoting Extensive Reading (ER). The center averages approximately 100 users per day, with about 150 materials on average checked out per day. Three types of learners were profiled in her SAC context of mostly first and second year students: Those who are actively autonomous (they don’t hesitate to ask questions, use the SAC whenever they need it, try to understand their own needs in relation to developing their skills), those who are passively autonomous (they want to improve their skills but have trouble entering the center or asking for help), and reluctant learners (those who are not all that interested in developing their language skills, may have other interests, and just need to graduate), Shibata assert that if SACs focus on making passive learners active learners, than hopefully reluctant learners will follow suit and become passive, and passive learners could become more active. Furthermore, in order to ensure that all learners continue to be engaged and active, Shibata also noted that arranging choices for learners is also important issue because learners often require assistance in choosing materials (particularly if ER is a popular focus area). A significant concept in Shibata’s presentation was developing a ‘culture’ of self-access – that is, creating and developing coherent policies and communicating it widely not only helps to cultivate a culture that students can identify with and then share with other students, but also serves to develop a greater understanding of the value of SACs among faculty and other stakeholders. With respect to this idea Shibata asserts that autonomous ‘leaders’ (those who are actively autonomous) are important influencers in the ‘movement’, and that the influencers, or leaders, are important to encourage. However she emphasized that the follower is perhaps more important in this case, as without them collective action, or cultural development cannot take place. Further to that idea, common interest has a key role in cultural development as learners can make social connections related to language learning, which then lead to sharing of experiences based on common interests, prompting other learners to experience and communicate what learning is like in a SAC. Arranging choices also plays a role in fostering and maintaining ‘SAC’ culture. As learners face so many options and choices in self-access – such as whether first-time users choose to enter the SAC or not, how long to stay, whether they interact with others in the space or not, whether they return or not (alone or with others), what materials to use or not, learners can be faced with ‘choice overload’. Shibata discussed approaching the mitigation of the materials problem by culling unnecessary materials, encouraging the proper categorization of materials, and being conscious of timing with regard to materials promotion and support. By encouraging students to use the SAC and certain materials before fixing their schedule at the start of the academic year, for example, and timing orientations and support efforts after holidays, school festivals and during breaks, students can be encouraged to use SACs more, and to use them with more awareness and efficiency. Shibata concluded her discussion by imparting the notions of having learners work from common objectives to create a ‘movement’ or culture in SACs, that it is critical to help learners make choices (especially when resources are limited), and that both learners and administrators maintain an awareness of timing when using and promoting activities and resources. Measuring whether or not SACs are effective and efficient in achieving their goals is a critical issue, and the undertaking of such a task is a particular challenge because of the uniqueness and complexity of self-access systems (Star, 1994). Also, as enhancing the effectiveness of learning rather than teaching is paramount, issues related to the efficiency of management of resources and people must also be carefully considered (Gardner and Miller, 1999). As there are a seemingly endless number of variables to consider within that scope, Katherine Thornton, Director of the English Cafe (E-CO), a self-access center at Otemon Gakuin University, discussed confronting some these issues in relation to her own context (a self-access centre opened in 2013). She also discussed how the contributions a centre is making could be effectively evaluated to meet both institutional and user needs. Specifically, the Whys, Whats, Hows and Challenges of SAC evaluation were individually addressed. As to Why evaluating a self-access centre is of importance, Thornton touched upon several areas that need to be contended with. Initially, whether or not a centre is meeting learner needs and identifying what those needs are is paramount, and then evaluating them in relation to what areas can be improved (which involves assessing not only how things are going, but how they can get better). Next, staff needs should be evaluated and feedback given in order to ensure job satisfaction (for instance, if teachers are staffed, they want to know if students are really learning). This is also connected to evaluating whether or not the SAC is meeting institutional goals (does it fit in with the various goals of the university?) and to account for existing funding and secure extra funding in the future. Finally, sharing evaluation results helps to increase understanding and support from stakeholders, hereby increasing the buy-in from skeptical staff, administrators and management. What to evaluate, according to Thornton, would involve assessing the efficiency and effectiveness of systems such as looking at the quality of management – specifically what is involved in the decision-making process such as determining the speed at which ideas and decisions come to fruition, and how your system is configured (or not) with regard to getting things done. In Thornton’s context, evaluating value for the money in terms of staffing, equipment and resources is key in looking at issues such as determining the number of student hours facilitated per staff hour versus student hours facilitated with no staff present, and examining the frequency of use in relation to their cost (for example, new technologies such as iPads are in the SAC, but how much are they being used?). The effectiveness of Learner Gain – whether or not, and to what extent the SAC facilitates language learning is central. And, as most SACs aren’t solely interested in language learning, the development of learner autonomy also needs to be addressed. In determining How to evaluate, Thornton noted that there is much quantitative and qualitative research that can be done and both should probably be used. It was recommended that narrowing the evaluation focus based on stakeholder requests (What do other people want to know?) and the SAC Mission Statement (establishing what you want to achieve, and evaluating the outcome of that achievement) was most effective in achieving this aim in her context. As far as the challenges that evaluation presents specifically in SAC environments, Thornton advocated making comparisons between course evaluations and SAC evaluations. For instance, whereas a course is likely to focus on linguistic gains, a SAC is more likely to focus on usage rates and development/promotion of autonomy; learner groups are fluid in a SAC, which is not the case for a course; users in a SAC aren’t as easily accessed as they are in a course – making finding out how users are using SACs difficult; SACs don’t have a control group to compare students who do use the centre to those who don’t; learning tasks are controlled in a classroom setting and teachers can assess how activities have an impact on learning, whereas SAC learners are carrying out a variety of different tasks which presents a problem in finding out whether what learners are doing is effective or not; talking care with imposing on learners’ autonomy in a SAC is different from a classroom setting in which students are told what to do and produce results. Finally, the challenges that encompass having little control over a wide range of variables presents a unique set of problems that classrooms/courses might not be facing. Thornton rounded out her presentation by addressing some thoughts and ideas toward sharing and presenting the results of evaluation, such as widening the shared audience (e.g. reporting to management and staff who are not ordinarily reported to, and sharing what other students are thinking with learners directly). Vehicles in which this information could be shared might include not only conventional means such as reports and presentations, but could be extended to online noticeboards and newsletters. Evaluation criteria is also a part of information shared, and in Thornton’s context included such key areas as of interest as usage pattern and statistics (it was suggested that there are two ways of recording how users are using the centre by: 1) headcount per class period and 2) counting by how many users are in different spaces per day), and including information on how students are using the center in relation to the aims of the centre’s mission statement. As some problematic issues were encountered in this process, one way that Thornton’s centre as dealt with this is by using student perception of the impact of the SAC as a springboard for evaluation. That is, taking a critical look at what is happening in the SAC, such as examining users’ language use (whether learners are using the target language or their native language), what the purpose of use is (if learners are using the space for social reasons, language study or something else), and what resources are being used and when, is not just producing a description of what is happening – but assessing it in terms of the centre’s impact. This is where elements of the mission statement define not only what is done on a daily basis, but whether or not those actions are aligned with the SAC’s mission. Thornton also suggests thinking about using case studies to show changes in learner behavior as an evaluative tool to that end. In conclusion, Thornton suggested that building accountability into recording systems, having a clear focus for evaluation that narrows the scope by determining needs, a variety of means of testing effectiveness of action, and creative and comprehensive means for information sharing are all factors that have proven useful in the evaluation process. Having the annual opportunity to engage in professional conversations through JASAL Forum has not only allowed for participation in an ongoing ‘reflective conversation’ about shared experiences in self-access, but has also afforded the chance to be part of a valuable exchange network for sharing our findings. Whether we are veteran practitioners or just starting out, by thinking about and reflecting upon what we do by looking at our own experiences as self-access practitioners and exploring and sharing ideas collectively, we are able to develop and refine a better understanding of our field. Erin Okamoto is a Learning Advisor at Kanda University of International Studies. New to self-access in tertiary education, she has a more extensive background in the field of Adult Self-access learning. I would like to thank all of the contributors to the JASAL Forum who have shared their time and valuable experience toward creating richer and more diverse self-access environments. Star, M. (1994). Learning to improve: Evaluating self-access centres. In D. Gardner & L. Miller, (Eds. ), Directions in self-access language learning. Hong Kong: Hong Kong University Press.